A game about swimming. Use your tail to propel yourself through the water. Hide in the shade of lilies to avoid predators and venture carefully into the open. Find it on: itch.io, Steam, Kartridge or Google Play. Check out the development log on TIGSource. Guppy version 29, adds option to remove ALL predators + other improvements. 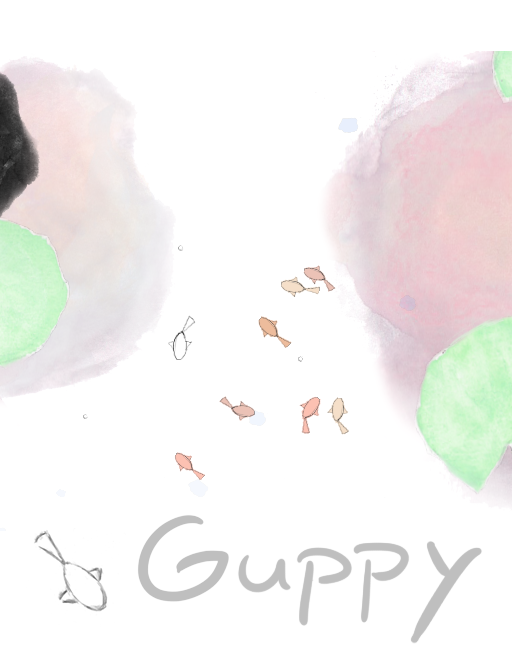 Guppy, 2D watercolor fish simulation, is now available on Steam! "Guppy - a game about swimming" is released on the iOS App Store. Guppy is now available on Mac via the Mac App Store and itch.io. Very nice game, keep making things like this will ya. This looks interesting. Will download later. Hahaha, cute little game, I like it. But I think that the view distance should be bigger - and the camera in the multiplayer mode needs some work. What would you change to the multiplayer camera to improve it? I ended up putting co-op split-screen in the latest version (24), but I do have the off-screen dying in "Follow"-mode where the camera sticks to the big fish (you can find it in the Menu Cave). It zooms out to slowly - sometimes you can swim out of the visible field when both players are far away from each other. RT @MinovskyArticle: Please pursue the timeless quality of not putting memes in your work.